What's happening in Dhurli is not a one-off. The same formula -- imposition of Section 144, arresting outspoken adversaries and holding them on charges of disrupting peace till the gram sabha hearing is over, forced voting instead of discussions and manipulated press reports are reportedly being used by the district administration to secure 'approval' for Tata Steel's proposed five million tonne plant in Bastar district's Lohandiguda block in July and August. The Tatas want 2,169 ha of prime, multi-crop agricultural land from 10 villages in the block for its Rs 10,000-crore project. 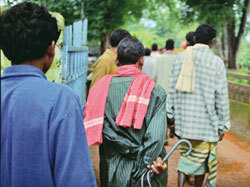 This correspondent visited Lohandiguda, where villagers said that people in all 12 villages, other than a small group of villagers, were against the plant proposal, at least in its current form.They had given the district collector a 13-point charter of demands, which, among other things, asked for a stake in the plant's profits, job security for future generations and compensation for land acquired with land of the same quality nearby. There will be a meeting to discuss the demand on October 16. Instead, villagers say, during the gram sabha on July 20 the administration trucked in people from other villages, paid them Rs 50 each, fed them lunch and took their thumb impressions. The local villagers, who were rounded up and brought to the meetings by police, were told they had to sign a resolution to adopt the charter of demands. Intimidated and confused, many signed. But in two villages -- Baler and Sirisguda -- people refused to sign. Another gram sabha was held in these villages on August 3, following which there were triumphant news reports saying, "The people of Lohandiguda finally vote for progress." A local bjp mla, Lachhuram Kashyap, had been opposing the plant on grounds of its location. "I had wanted the location to be moved to another spot within the block where the land is uncultivable," he says. But Kashyap's party made sure he was nowhere near Lohandiguda when the gram sabhas were held. Kashyap is a subdued man today, aware that his political career is probably nearing an end. "I won't contest this decision any more," he says. "It's our government, they want it... I'm just one person. Who am I to say or do anything?" But, like the villagers of Dhurli and Bansi, people here haven't given up yet. "We have no fight with anyone, we just won't compromise on any single point in our charter of demands," says Lakhmiram Bagel of Baler village. There have been some efforts by Chhattisgarh activists to fight the tribals' cause against the steel giants. Three persons, including Agarwal, had filed separate public interest petitions against the proposed plants in the high court alleging procedural and environmental norm violations. But the court dismissed the litigation saying the Chhattisgarh government had only signed memorandums of agreement (mous) with the two companies and no final agreement had been made. Meanwhile, on September 21, a group of tribals from Lohandiguda, Dhurli and Bansi reached New Delhi and submitted a memorandum to the National Commission of Scheduled Castes and Scheduled Tribes requesting an enquiry into procedural violations during the gram sabhas. The memorandum said the consent of the gram sabha was obtained at gunpoint. It also said that the government routinely brands anyone who opposes big industrial projects as Naxals. Tata Steel’s version of Dantewada events Tata Steel has taken every care to ensure that the villagers were fully informed of all plans and practices followed by us in the rehabilitation and resettlement of displaced people, for those in the proposed site as well as in other sites. We are not in position to comment on the conduct of the gram sabhas since they were conducted by the state government, but we did have the whole procedure video filmed and these tapes are there for anyone to see with regard to the fairness of the process. We on our part ensured that there was no coercion and that the process went on peacefully and we are convinced that the villagers gave their consent under their own free will. Tata Steel also believes that the in the process of resettlement and rehabilitation, the affected population must end up with a higher standard of life with security for a sustainable future, which is not possible in their current way of life. You may be aware that we shall be soon discussing the rehabilitation plans with the Chhattisgarh government and we are sure that our plans will better those in the government’s policy. We are sure of the acceptability from the villagers, as these have already been shared with them. The communication of the finalised plans will be done in the most transparent manner and the suggestions of the villagers will be taken into account. We would like to present all this to you and any other genuine stakeholders to help you decide on the fairness of the offers.